I often hear complaints from people who are sick and tired of rotating between only spinach and kale in their green smoothies. News flash! There’s a wide variety of green leafy veggies to choose from. Arugula, radish greens, swiss chard, collards, beet greens, lettuce, and one of my personal favorites, dandelion greens. 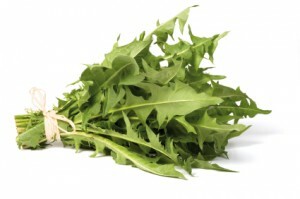 Dandelion greens are a very healthy option, and most people have free access to them right in their own backyard. Although, you might want to do some research on the best time of year and places (tall, well watered grass is ideal) to harvest wild dandelion greens. You definitely want to avoid areas sprayed with herbicides, pesticides, near roadsides, or where animals often do their business. Apple, banana, lemon, and dandelion combine to offer much in the way of health benefits. You’ll be getting plenty of dietary fiber, vitamins, minerals, antioxidants, and important plant nutrients that support healthy immune function, proper digestion, and light detoxification (from dandelion greens and lemon). Coincidentally, while in the process of writing this recipe post an article on Natural News was published on research showing dandelion to be a potent cancer cell killer. The studies were based on dandelion tea, which is an option for the base of your smoothies, but I bet most of the health benefits are also derived from the plant itself. Check it out: Dandelion Cancer Prevention. If you’re new to dandelion greens, they can be a little bitter; so you may want to only use 1/2 cup, or substitute 1/2 cup of spinach. Enjoy! Place all the ingredients into your blender and blend for 30-45 seconds or until the desired consistency is reached. Try this apple dandelion green smoothie? Please leave a comment below and tell me all about it. Happy Blending! Thanks for the recipe! Sounds delicious. Will give this a try tomorrow morning. I may possibly add baby kale as well. Hey Beneatha, baby kale will be a fine addition to this recipe. Enjoy! Are you familiar with Sun Warrior’s vegan protein powders? If not, check out my review. I’m partial to the chocolate myself, vanilla and plain are the other flavors. Peanut butter is another option to boost the protein. Ideally you don’t eat anything else when drinking your smoothies to ensure optimal digestion and assimilation. Please I’d like to know whether to boil the dandelion greens or just to add it raw. Thank you. You can use them raw, Wendy. Cheers! Sure, moringa powder would be a nice upgrade to this smoothie.